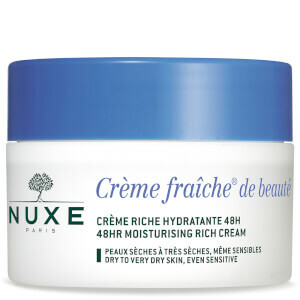 Keep skin safe and hydrated with NUXE Crème Fraiche de Beauté Moisturiser for Normal Skin, a hydrating formula that delivers 48 hour moisture whilst shielding against urban pollution. 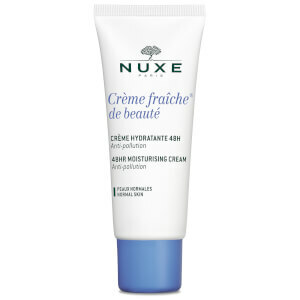 Ideal for normal skin types, the comforting moisturiser melts effortlessly into skin, softening, soothing and protecting with its dose of Vegetable Milks and Algae extract; skin is safeguarded against damaging environmental pollution and is left feeling soft, fresh and plump in appearance. 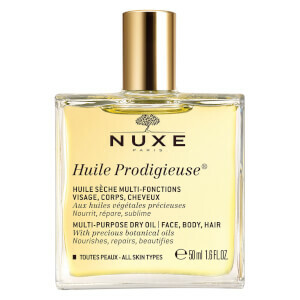 Aqua (Water), Glycerin, Caprylic/Capric Triglyceride, Dicaprylyl Ether, Butyrospermum Parkii (Shea) Butter, Cetearyl Alcohol, Macadamia Integrifolia Seed Oil, Parfum (Fragrance), Xylityl Glucoside, Glyceryl Stearate Citrate, Behenyl Alcohol, Dimethicone, Lauryl Laurate, Silica, Anhydroxylitol, Tocopherol, Polyglyceryl-3 Stearate, Phenoxyethanol, Xylitol, Ethyhexylglycerin, Hydrogenated Lecithin, Sodium Acrylates Copolymer, Sodium Stearoyl Glutamate, Dehydroacetic Acid, Allantoin, Sodium Digluconate, Lecithin, Helianthus Annus (Sunflower) Seed Oil, Citric Acid, Sodium Carrageenan, Sclerotium Gum, Glycine Soja (Soyeban) Oil, Camellia Oleifera Seed Oil, Capryloyl Glycine, Citrus Aurantium Dulcis (Orange) Flower Extract, Prunus Amygdalus (Dulcis) Sweet Almond Oil, Glycine Soja (Soybean) Seed Extract, Pisum Sativum (Pea) Extract, Disodium Edta, Avena Sativa (Oat) Kernel Extract, Maris Sal/Sea Salt, Camellia Sinensis Leaf Extract, Prunus Amygdalus Dulcis (Sweet Almond) Fruit Extract, Robinia Pseudoacacia Flower Extract, Cocos Nucifera (Coconut) Fruit Extract, Linalool, Geraniol, Limonene.